My 15th annual garden show and sale in my backyard and studio! See my art in its natural environment. Pottery and felted work will be on display and for sale. I will also have a seconds table, so come early for great bargains! Rain or shine. Click here for a map to my location. All are welcome. Bring friends. Enjoy a lovely drive through the countryside. Art Demonstrations all weekend! Come see how it's made! Lou has whimsical garden totems, and gorgeous floral blessing bowls. Angie Turkulja, the Artful Blingster, creates handcrafted, one-of-a-kind jewellery, with the focus to creating something that is as strikingly unique and versatile as the woman who will wear it. Carmen Nistor Caldwell creates fabulous upcycled purses and aprons from bluejeans and mens’ suits. They’re practical and super fun! ALSO NOTE: The same weekend, the Artists in the Country have their spring show, just 4 KM west of us and 4KM east of us, the Escarpment Artists have their spring show. SO within 8 km you can see 30 artists in 3 studios!! 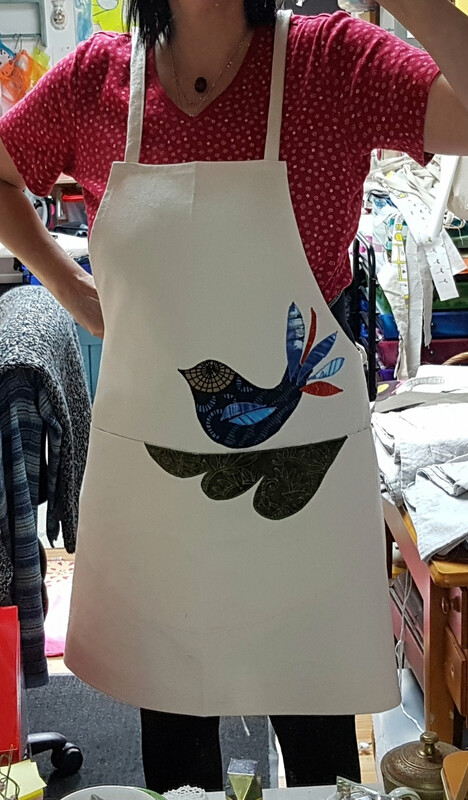 Just one style of Carmen’s aprons. Angie’s exquisitely hand wrapped copper wire pendant.